Nurturing Across Cultures (formerly The Rebozo Way Project) expanded its focus to cultivating collaborative community in 2013. The projects listed here are no longer active or updated. This site remains online as a resource for the global community, in the hopes that the work and information exhibited here will be an inspiration and resource to others. You may copy and distribute most articles on our site for non-profit educational purposes related to our mission so long as you include a link back to our site. Please see specific terms and conditions at the end of each article. If an article is not licensed under a Creative Commons Attribution-NonCommercial-ShareAlike license, you must contact the author for permission to reproduce the work in any form. 1.- Newborn Carry Can be worn until about 2 or 3 months, or when child has good neck control and wants more outside contact. We at the Rebozo Way encourage the traditional Forty Days of Rest after childbirth, a honeymoon period of keeping baby close and often in-arms, sleeping when your baby sleeps, establishing breastfeeding, and integrating the baby into the family. We do not encourage prolonged babywearing until babies are over two weeks and preferably over a month old, except for Kangaroo Care, which we encourage as best practice for premature infants. 1-1. The simple easy carry for newborns begins with the wearer putting on the shawl with the shorter end draped over one shoulder, and the longer end dropping across the back. 1-2. 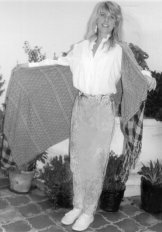 Bringing the longer end to the front around the waist, the shawl ends are tied together in a double knot, between the shoulder and breast, so that the fabric below the knot that hangs to the wearer's waist, forms a sling for the babe to slip into. 1-3. Now make a pouch with the fabric, and, sitting down, pick up the baby, supporting his head, neck, and spine, and slip him into the sling created by tying the knot, with the child's head up near to the knot (with the check near or just under the wearer's breast, and slightly facing up), and the child's bum on a slant down toward the wearer's waist, with his legs tucked in behind in a natural position. The shawl should be tighter at the edges to keep baby in secure, and spacious enough in the middle to allow the child room to shift in sleep or root for the breast (if with mom), yet give good support for the new baby's head. The rebozo fabric is see through, breathe through to the baby, yet looks opaque to a passerby a foot away, so allows for maximum privacy and comfort for the newborn, hands-free bonding for the parent. This carry imitates one common way one would hold a baby of this age in arms, more horizontal than vertical, close to the wearer's chest. 2-1. Again, begin with the shorter end of the rebozo draped over one shoulder (for variety here we see the opposite shoulder than used in the newborn carry), and longer end behind the body to the waist. 2-3. 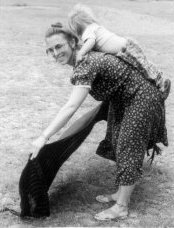 Babe can be picked up while wearer stands or sits, and slipped into hip position, straddling wearer's hip with both legs—the weight and shape of baby's bum provides the counter pressure that stretches fabric and keeps rebozo taut, provided that her knees are positioned above her bum. Very comfortable and social for wearer and baby, child's weight rest on wearer's hip, and taking her out of this carry is as quick and easy as putting her in. 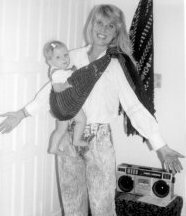 This carry also imitates a common way babies of this age are carried when not tied on; with the rebozo, both wearer's hands can be free while child is secure and close. 3.- Sitting Carry For child six weeks - six months, or older, with good neck control. 3-1. Follow directions for newborn and/or hip wrap, place short end of shawl over one shoulder and let longer end drape behind the waist. 3-2. Tie knot to form sling as in newborn and/or hip wrap. 3-3. This time babe is slipped into the rebozo sling with his head opposite the knot on the chest, with extended feet stretching out towards the knot. The rebozo edge can be left at baby's armpit as illustrated here, the fabric can be pulled up near child's neck for more support, or you can pull up the higher edge to cover child at times when discreet nursing is wanted, or child falls asleep. Baby's back arm may hold wearer around the back (inside rebozo), or be in front within the rebozo pouch; front arm can be in or out, arms can be repositioned or moved easily while child is worn. The little one's bum is usually slightly lower than his feet, as shown in the drawing. NOTE: different rebozo wraps may need slightly different shapes or sizes of the pouches created, or may need to be tied slightly differently as child grows. If one wrap comes much more easily than another, try using a distinctly different size pouch for better results by taking up or letting out the rebozo ends. 4-3. As one gets used to using the rebozo, we find that there is a contact point for the baby's bum that we aim for as we slip baby in. In this wrap, that point is lower than in the sitting wrap, and probably the hip wrap - there is a lot of material (approx. 30" wide) in the rebozo, yet it is so light, it is not bulky when there's no need to open it fully, as in the sitting wrap. Then when we want or need the full width of material, - as when we want to nurse discreetly or sling baby for sleep, not for quiet alertness, it is available to us. When we put babe directly into the hip slung wrap, maybe when they are fussy and the movement in rebozo will lull them to sleep, we find that contact point that allows us to stretch the fabric up to baby's chin or even completely covering head, and lets legs dangle out from the knees (the lower bum provides the tautness that keeps this wrap secure). The shape the child's body forms inside the rebozo allows maximum rocking while wearer is strolling, if that's what's wanted, and/or easy discreet access to the breast, whether wearer is sitting or on the move. At this age (after 6 weeks), we recommend stopping to nurse, sitting or standing, and resuming our course of action, without needing to remove rebozo or child, once babe is satisfied and/or has dozed off. 5.- Traditional Baby Back Carry Approx. six months to toddler. 5-1. Child stands or sits, apart from wearer, with rebozo shawl draped around her (the baby), positioned exactly in the middle between the ends; the wearer holds the shawl next to the child's back by her armpits (the baby's). To begin, wearer and baby should be facing the same direction, not looking at each other. 5-3. 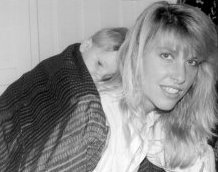 Here the wearer adjusted the upper rebozo edge to ride tautly across the child's upper back, but leaving her (babe's) arms free, and the lower edge under the baby's bum, to join on the wearer's chest. Notice how the child assumes a sitting position in the rebozo cloth, providing the counter pressure that keeps her securely in her carrier. Alternative variations of this wrap include: wrapping rebozo with child's head inside (another good sleeping variation), wrapping child's legs and feet within rebozo (great for colder climates), and (shown here) twisting the child-shawl unit to the front, which can be done at any point while wearing baby—f you or she should suddenly want eye contact, feel a need for more protection, want to nurse or share food or drink, etc. 6.- Piggyback Baby Back Carry From whenever child can get on you piggyback, best after about one year old. 6-1. 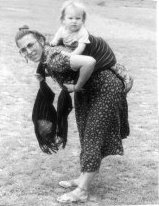 Baby climbs on wearer in a piggyback fashion, while wearer opens rebozo ready to swing it onto baby in back. 6-2. 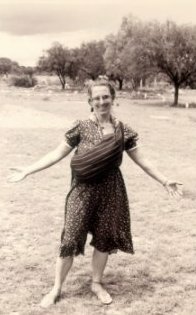 As in traditional baby back wrap, wearer swings shawl in a half circle to rest (now over baby) on her back and holds both top and bottom rebozo edges taut, one end going over her shoulder, the other around her waist. 6-3. 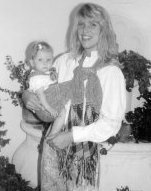 Having tied the double knot in front to hold baby on, wearer is checking that babe is in sitting position with rebozo taut underneath, and may open baby's legs to straddle her (wearer's) waist if he wants to remain on back. In this variation, the babe and shawl unit have been twisted around to the front, and the knot travels to the upper back: baby's legs may straddle wearer's hip, or be left to hang loose as seen here. I found leaving a bigger baby on back the most comfortable for us both most of the time; in special circumstances, a prompt shift to the front is available. Article licensed under a Creative Commons Attribution-NonCommercial-ShareAlike 3.0 Unported License. 2011 Nurturing Across Cultures & others. Some rights reserved.